Wedding flowers are seen by many brides as an integral part of the big day, but one woman from Australia went for an untraditional choice for her vows. 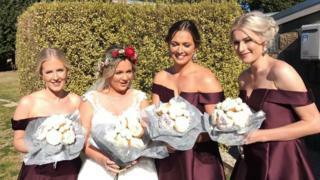 Paige Kirk, 23, from Sydney, surprised her bridesmaids with a set of bouquets filled with decorated pastries. "Me and my husband Steven thought it would be different, fun and light hearted," she told the BBC. Despite their tempting appearance, she said her bridal party had resisted eating their doughnuts on the day. "We had plenty of goodies beforehand so we were too full too eat them," she said. The bouquets were donated in a competition by a company that wanted to create an alternative to flower gifts. But Paige was the first bride to take the unusual edible bouquets down the aisle. Asked about the reaction, she said her guests "loved them". "Everyone thought it was hilarious, and the venue couldn't believe it," she said. "Brides should be a bit more relaxed and have fun!" Steven and Paige have known each other for five years, and been together for three. "We wanted the wedding to be a bit different and really reflect who we are as a couple," she explained. But she admitted she was shocked by the reaction, after thousands of people commented on the pictures of her and her bridesmaids with their unusual bouquets since Saturday. For Sale: Wedding Dress. Never worn.